The newest addition to the Inkfish brand power house! Delivering a modern take on the salon experience, bringing Falmouth years of expertise, creativity and passion. Grace was amazing, thank you so much! Called in on the off chance that they could fit me in for a blow dry. Excellent service again no fuss just get on with it. Only wish I had an Inkfish in Wales. 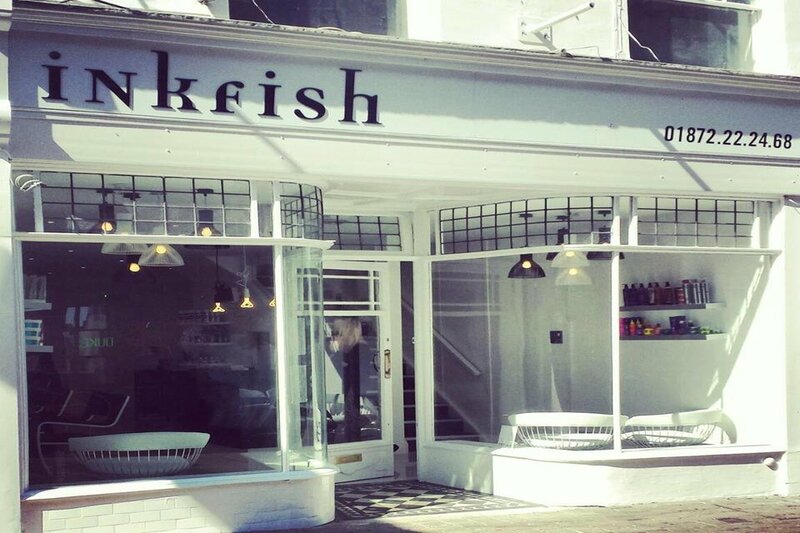 I am very impressed by the standard of hair styling and treatments at Inkfish. A very welcoming and professional staff from the moment of greeting you at the door to having your chosen stylist or beautician provide an excellent service. Friendly atmosphere. Feel like they genuinely care and I'm always happy with my hair. Grace is amazing with colour (and cutting) and I trust her opinion completely when it comes to my hair. This was my first ever visit to Inkfish..
Not had my hair cut for nearly a year (been putting off a much needed cut/restyle for way too long)!! I was feeling quite nervous,but felt completely confident and trusted that I was in safe hands..The stylist was patient and informative,also took time to talk me through what she would work best for my hair type etc.. I can honestly say I could not be any happier with my unplanned,let's just do this haircut..
Taken years to find a hairdresser that actually knows how to style & colour my hair! Amazing hair do experience, just sit back and relax! Friendly staff to chat to. It’s the ultimate peace and me time ever!! Karis did a amazing job! Looking forward to continuing my process of becoming blonde! And seeing the end result! The staff absolutely amazing!! Really really happy with everything! For sure I will come back indeed! Megan once again got me out of a jam. Off in holiday and my hairdresser was poorly. Megan did a great trim and style... remembered my preference from a previous visit too. Thank you!